Sericin is refined form silkworm body (spun silk gland),pod(pod shell, watt silk) and silk. SINOSILK is the first ever to succeed using a unique technology, extracting and refining sericin in China.We are recognizing people's wish for beauty and health by providing a wide range of products including cosmetics, textiles and hair care products. There are 18 kinds of amino acids in sericin,　among which,　serine and aspartate have the highest content. Besides, it has the other amino acids necessary to human body, it is an excellent protein. Because in sericin, about 80% amino cid has hydrophilic lateral group, about 1/3 of which is serine which water absorption is 50 times high than that of glycerin. 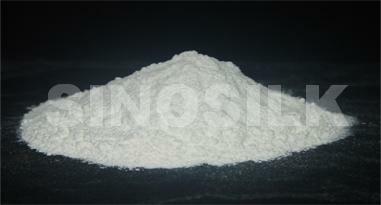 Sericin, as the raw material of cosmetic, has excellent moisture absorption and preservative ability. Sericin protein can form a film on the surface of skin and hair so that the water in skin can be preserved, and then the harm to skin cutin can be avoided. By applying it, the skin can be soft and smooth, and the hair can be soft and flexible, and it also benefits for the shaping of hair. Meanwhite, it will not adhere to hair. Sericin is excellent in moisture preservation as it contains serine, one of the most important amino acids among the NMF. It is also effective in controlling the occurrence of active oxygen, the factor which breaks down the protection of the skin's surface, as well as tyrosinase, which causes the skin to freckle. As it is gentle on the skin and is an excellent moisturizer, protector and whitening, it is attracting attention as a skin care ingredient. Sericin is smooth and gentle on the skin. Fraichir gives wearers a silk-like fresh comfortable feeling by reducing the uncomfortableness of being sweaty and wet. Sericin has an amino acid structure similar to NMF (natural moisturizing factor) which is naturally part of our human makeup. Among these is "serine," an important moisturizing acid which has a high consistency in sericin, providing a moistening element. Furthermore, further purified pure sericin acquires the same amount of moisture and smoothness found in silk. It is as smooth as silk and does not stick to skin. Yet even after repeated washing, its effect remains almost the same. It gives a gentle, soft silky touch. A skin care material produced from pure sericin, less irritant and gentle on delicate skin. Silk, a material soft and gentle on skin, covered with protein. This protein is further purified and used to coat every yarn. A veil of pure sericin softens any irritant touch and protects delicate skin. Even after repeated washing, its effect remains almost the same. It has been verified as safe by a medical specialist. Package: This product is packed in compound plastic bag 500gr, which the shelf life is two years under the sealing condition.